You'll be £8.00 closer to your next £10.00 credit when you purchase The Napoleon Options. What's this? 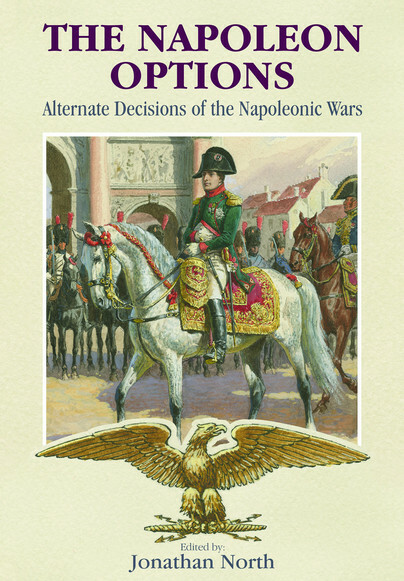 This compelling alternate history, brilliantly written by fourteen leading international authors, presents the great maybes of the Revolutionary and Napoleonic Wars The Napoleon Options focuses on some of the pivotal episodes of these catastrophic wars, giving them a resounding twist, and explores in detail an alternative sequence of historical events. Rooted firmly in reality, and projected from entirely factual events, these dramatic and plausible possibilities are played out as though they actually happened in vivid and dramatic narratives. The Napoleonic Options presents ten scenarios spanning the years between 1796 and 1815. These include a full-blown French invasion of Ireland, a very real danger in the 1790s; Napoleons successful conquest of Egypt and the Middle East; Junots victory at Vimerio; the Austrian invasion of Bavaria in 1809; the Russian success at Borodino, and what might have happened at Waterloo. Amongst the addition contributions in this new extended edition are alternative outcomes to the battles of Essling, Austerlitz, Fuentes d Ooro, and New Orleans. These captivating scenarios colourfully illustrate how alternate results might have radically re-shaped events and demonstrate the far-reaching consequences minor changes could have had upon the future course of history. This text by Jonathan North is a fantastic book well worth the read. For those just starting off with the epic period studies, the historical student or for experienced Napoleonic experts this work has something for each one. I would highly recommend buying this book, I found it to be a very good read with superb flow throughout each expose and short study. North has assembled some brilliant scholars here with each segment exceedingly well done both in theme and writing. The coverage of material will whet your whistle for further works in the Pen and Sword Publishing library. The individual authors put forth some outstanding material and the collection is really an All Star effort of sorts. I thoroughly enjoyed the John Elting and Kevin Kiley chapters, while Digby Smith’s Borodino effort was superb and greatly enjoyable. Gareth Glover and Peter Hofschroder produced stellar work and overall it would be difficult to identify a single weak link among the contributors whatsoever. The breakdown of various historical tangents all served to produce a great journey back through history. I normally do not appreciate historical variations yet found this work to be worth a second read already. It has a nice flow to it and moves along quickly from chapter to chapter. The illustrations and maps are solid and I feel the book would present itself well in the world of situational gaming. The ability of the editor to combine the period with concise battle reviews is extremely solid. And all the what-ifs of each situation presented serve to refresh even the most over-red of students on the subject of Napoleon’s battles and strategies. I will highly recommend this book and would package it with the Wellington books of the Headquarters and Brigade Commanders text just out. They make for some superb combined readings. All the chapters of this book suceed in meeting the two most important criteria of counterfactual history. The first of these is making the reader pause and reflect on the strange and complex circumstances that shape history. Whether it be the effects of wind and tide on troop deployments, the presence of an inspirational commander at a pivotal moment on the battlefield, or even a decision to disobey an order. The Napoleon Options clearly and effectively demonstrates that there were numerous points at which the fate of the Napoleonic Wars could have been decided in a very different way. The second, equally important, criteria is that reading this book is quite simply good fun. The writing style is light and fast paced, inexorably drawing the reader on. This is a book which grips you and keeps you guessing about which subtle elements of history have been rewritten. Translator and editor: Jonathan North is a professional editor and a historian specialising in Napoleonic history. He spent a number of years in Eastern Europe before beginning a career in publishing in 1997. His publications include With Napoleon in Russia: The Illustrated Memoirs of Faber du Faur, In the Legions of Napoleon: The Memoirs of a Polish Officer in Spain and Russia, 1808-1812 and Napoleon’s Army in Russia: The Illustrated Memoirs of Albrecht Adam, 1812.